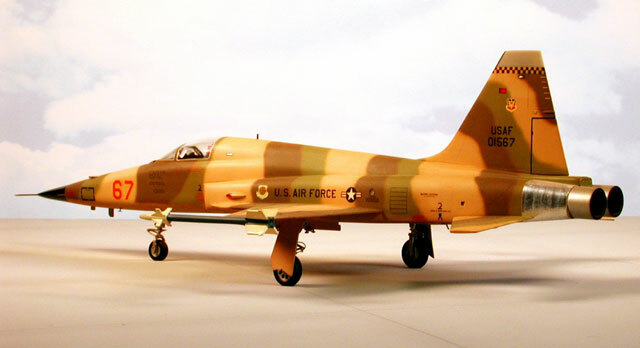 Here is the 1/48 scale Monogram F-5E completed as a USAF aggressor aircraft assigned to the 64th FITS, 57th FWW, Nellis AFB, NV, circa 1980. 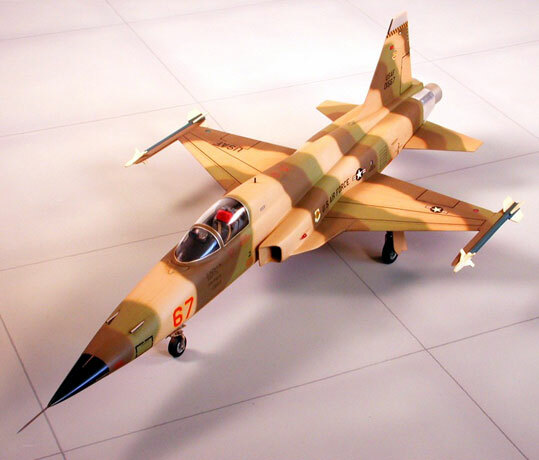 As issued, the kit features a full set of pylons and ordnance though in its MiG-5 Humiliator guise only the centerline pylon and occasionally the fuel tank will be seen on these aircraft. The gunpods and laser-guided GBUs included in the kit were consigned to the spares box. 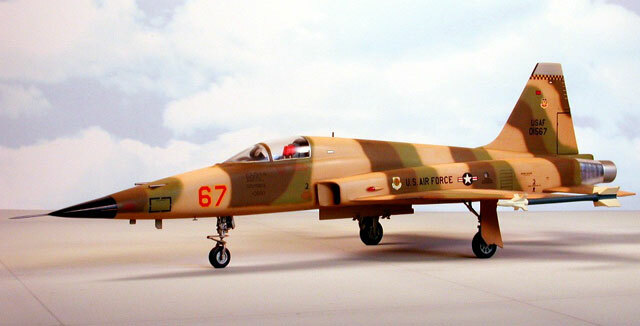 One unadvertised feature of this kit is the numerous antennas, sensors, and recce nose, which may be used to construct any number of foreign-customer F-5s if the appropriate decals are used. The model was detailed by adding the various navigation and position lights using a combination of colored Lexan and MV lenses. Numerous cooling outlets on the fuselage were drilled out to add the illusion of depth, while the centerline pylon received a set of scratch-built sway-braces. I added brake lines to the main gear struts while the nose unit got some additional detailing in the form of a new torque link. Hypodermic tubing was used to replicate the 20mm nose guns, with a stainless steel sewing needle drafted for duty as a pitot tube. The simplified moldings include stabilators molded integral to the upper fuselage. These were sawn off and reattached using brass wire pins. I replaced the tailpipes with short lengths of K & S brass tubing and used various scrap bits of photo-etched fret to duplicate the AOA indicator and outside air temperature probe. To present as clean an airframe as possible I elected to close the canopy, thus concealing the rudimentary cockpit. 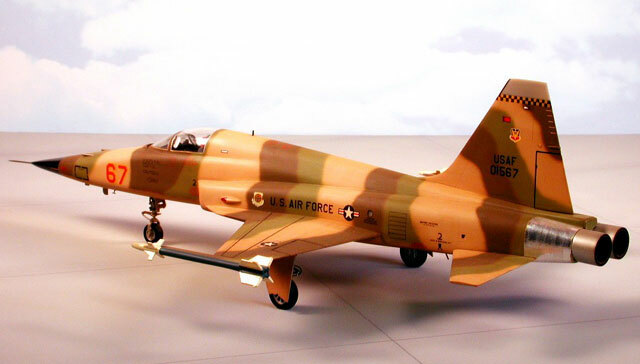 The model was painted in the ‘Snake’ scheme using a combination of custom-blended Pactra enamels (FS 33531 and FS 34258) and ModelMaster Field Drab (FS 30118) enamel. Bare Metal Foil was used for the unpainted portion of the rear fuselage, while buffable Spray ‘n’ Plate (now part of the Testor line) was used on the afterburners. Testor’s Glosscote prepared the surface for decals and after applying the salient items from MicroScale’s 48-53 sheet, a heavy dusting of Testor’s Dullcote sealed the finish.